This question: What are some funny loading statements to keep users amused? But since then it has been deleted on November 9th. I have seen this with a few of the historically significant questions like What is the best comment in source code you have ever encountered? and a few others. Why weren't they kept for the reasons they were there before? Now I notice that Strangest language feature which was mentioned in a blog post was not deleted! Is it some sort of favorite for all of time and space? Why do some of these questions seem to get special treatment? We are handling flags on these historical, popular, but off-topic questions on a case-by-case basis. This question is not historically significant. It does not educate; merely amuses. A lot of fun was had at some point, and people still upvote and comment on the answers regularly (see timeline) but it's time has come to retire quietly into the sunset. And by that I don't mean locked (it already is)... it ought to be nuked. Shog9 agreed with the flag, and deleted the question shortly thereafter. Don't get any grandiose ideas; if you start going on a flagging rampage, you better make a really good case in your flag descriptions. "Has historical significance" is the polite way of saying "some people get angsty about the scope changing". The questions you mention have no value apart from entertainment. While most of us like to have a little fun, the primary purpose of SE is to get problems solved and questions answered. Being funny while you're doing that is great; just being funny isn't. As many have said, SE can't be all things to everyone, and it certainly isn't going to be a joke site in addition to a Q&A site. The people who care about these questions — the ones for whom they are "significant" — had a chance to say their goodbyes, to grab a screenshot or copy and paste the content for safekeeping, and so on. So now the questions shouldn't have any significance, right? They're just useless, apart from the "use" of attracting similar now-off-topic questions. Broken windows and all that. Obviously I didn't delete these and I don't know the actual rationale, but this is my take on the issue. I wish for all such questions to die a hasty death. I have an attachment to my old posts and appreciate humour too, but if they didn't fit I would get over their deletion. I don't see a reason to make a fuss. I'm sure that this has been discussed many times before on Meta SO, but I can't find a good canonical answer at the moment. Hopefully this will help. Questions like these were originally asked when Stack Overflow's community and focus were different than they are now. At the time, Stack Overflow had all sorts of polling and subjective questions that were very popular because they were fun. (In fact, even Meta questions were originally asked on Stack Overflow!) As the site grew, however, these "soft" questions were no longer considered on topic and in fact any new questions like them were often subject to closure. Leaving the old, "historically-significant" questions around creates broken windows and confuses new users who ask similar questions that are then closed. Also note that these questions are usually not deleted permanently and should still be accessible by moderators and users with 10k+ rep. The data is still there, but leaving it visible to everyone creates confusion about what the site is really about. When in doubt, though, consult the FAQ. 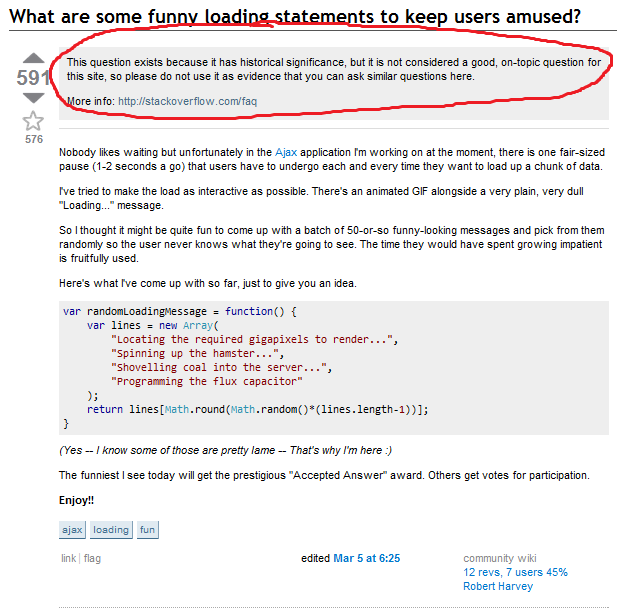 According to the FAQ, the questions you pointed out—"What are some funny loading statements to keep users amused?" and "What is the best comment in source code you have ever encountered? "—would be prime candidates for being flagged and possibly removed. Communities have to be consistent in their rules and enforcement to prevent their own members from tearing them apart. I believe the recent deletion of such questions is part of the growing pains of Stack Overflow. They do hold historical significance, but that significance changes for the community over time. Stack Overflow is, after all, a living breathing community which changes from time to time. It's certainly not what it was, nor what it will be. I think Stack Exchange could benefit from an archiving process in this matter. Maybe add a feature to the engine whereby moderators (or the community in general) can vote to preserve a historical copy of a question, but remove it from the general use of the site? A problem with these questions now is that they serve to confuse new members of the community. After all, how can the most popular and highest-voted content in the site be off-topic? Doesn't the presence of so many votes indicate community approval? That is, after all, what we tell people about votes. Let the community decide. So the problem we're running into now is one of historical changes to the community. I suppose it's a good problem to have that the site has been around long enough, seen enough content, and grown enough as a community that we now face this issue. If these questions were asked today, they'd likely be quickly closed. They're just not on-topic... today. But they were at one point. And they contain useful information. So I definitely see a need to preserve them somewhere for the Stack Overflow community to enjoy, but simply sweep out of the way. Once the site takes off the question will be migrated to them. It is a conspiracy, perpetrated by an unholy alliance of internet bureaucrats and jQuery fanboys. They want to change the way we remember things. "Do more, remember less", they chant. I find this latest development terrifying. Why are deleted answers containing hate/obscenity still accessible/viewable?